Ryzen 3 2200G and Ryzen 5 2400G just stepped in to give budget gamers a worthy alternative. Can the Ryzen APU run Crysis? How much does memory matter to a Ryzen APU? Let’s just lay our cards down at once. AMD’s Ryzen 3 2200G and Ryzen 5 2400G APUs are everything budget gamers have been praying for: surprisingly decent gaming performance at a shockingly low price. In years past, such a statement would be met by skepticism and dismissive “whatever” animated GIFs. But AMD actually over-delivered on its Ryzen CPUs last year, so talks of combining those same Zen cores with the latest and greatest Radeon Vega graphics cores has cash-strapped gamers in a tizzy of excitement. And it turns out the excitement is warranted. 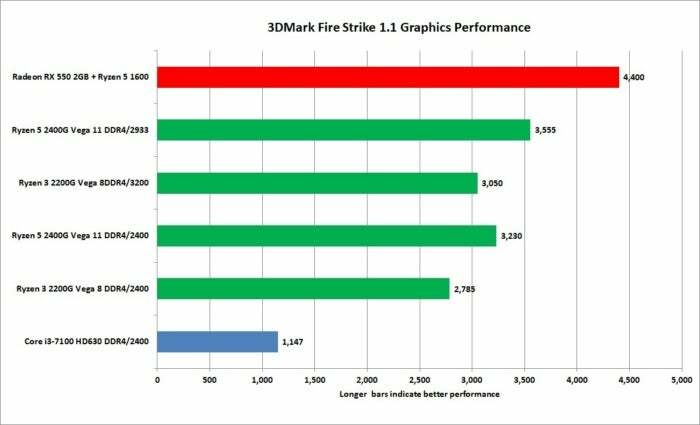 Compared to a similarly equipped Intel-based system running a Core i3, the lower-end Ryzen 3 2200G is 142 percent faster in 3DMark Firestrike, 154 percent faster in 3DMark Time Spy, and 203 percent faster in Rainbow Six Siege. Those are just a few of the highlights from our game performance testing, which you can see if you jump to our gaming tests. In practical terms, AMD's new budget wonder chips should be able to produce a reasonable 60 fps at 720p in many games, and some will be playable at 1080p, too. So if you've been avoiding building a gaming PC because of sky-high GPU prices, these new AMD APUs provide some intriguing options—at least on the budget end. Now we'll dig into the Ryzen APU specs and architecture before we return to our performance results. For real: The $99 quad-core Ryzen 3 2200G offers graphics performance competitive with $99 graphics cards. There are two Ryzen APU parts being released Monday. 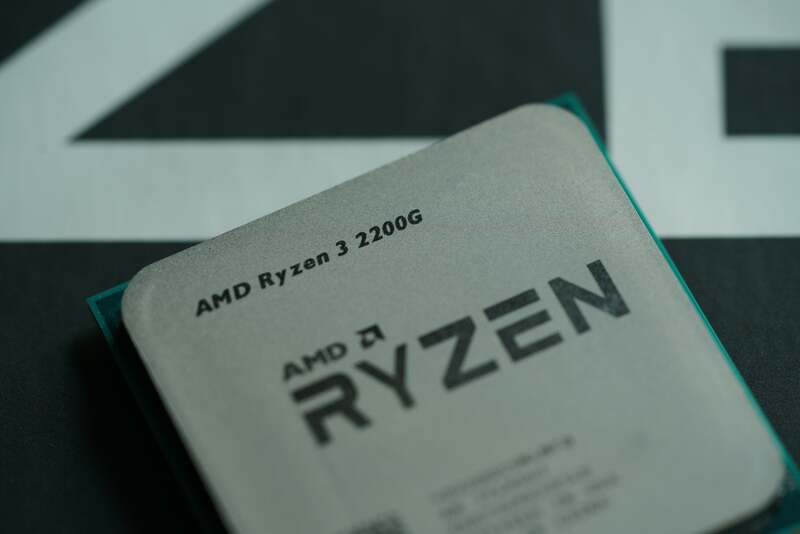 The Ryzen 3 2200G ($99 on Amazon) features four Zen cores without symmetrical multi-threading (SMT), which is AMD’s version of Intel’s Hyper-Threading. The cores have a base clock of 3.5GHz with a boost clock of 3.7GHz. For graphics, it features eight Vega compute units (CUs) inside. Yup, the same Vega cores used in the company’s impossible-to-obtain Radeon Vega cards (reviewed here). 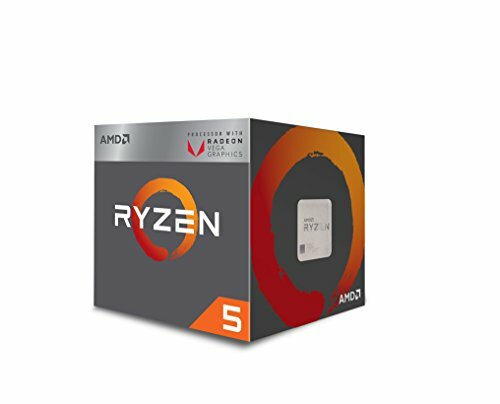 One step up is the Ryzen 5 2400G ($169 on Amazon). It still nets you a quad-core chip, but with SMT switched on for a total of eight threads of computing power. AMD also increases the base clock to 3.6GHz and the boost clock to 3.9GHz. For graphics, you get about a third more CUs, with 11 Vega units inside. Both are AM4-based and should work in most AM4 socket motherboards that have display outputs and the latest BIOS available. Unlike Intel, which locks its lower-end chips, AMD has left them unlocked for those who want to explore overclocking. Although the actual Zen cores are the same, the Ryzen APUs differ from Ryzen CPUs in a couple of key ways. In the chart above, three things should jump out: less cache, half the GPU PCI lanes, and the use of a single, unified CCX in the APU, rather than the dual-CCX design in the current CPU. All Ryzens are modular and built around the basic four-core CCX unit. An eight-core Ryzen 7, for example, features two CCX units. On the six-core Ryzen 5 CPU, AMD disables a core on each CCX and links them together. On the four-core Ryzen 5 CPU, two cores are disabled on each CCX. This CCX link has a real cost in latency (which tech website PCper.com thoroughly explores here.) With its new APU, AMD said it needed to save space and make thermal room for the overhead of the Vega cores, so it went with a single four-core CCX. This eliminates the latency issue, but also lowers total cache, as each of those CCX units has a dedicated cache. AMD said the practical impact in its own testing was minimal: Some games pick up a little gain from lowering the latency, while others benefit slightly from the increased cache size. To help make up for the cache decrease, AMD said, it buffs the clock speeds a bit. 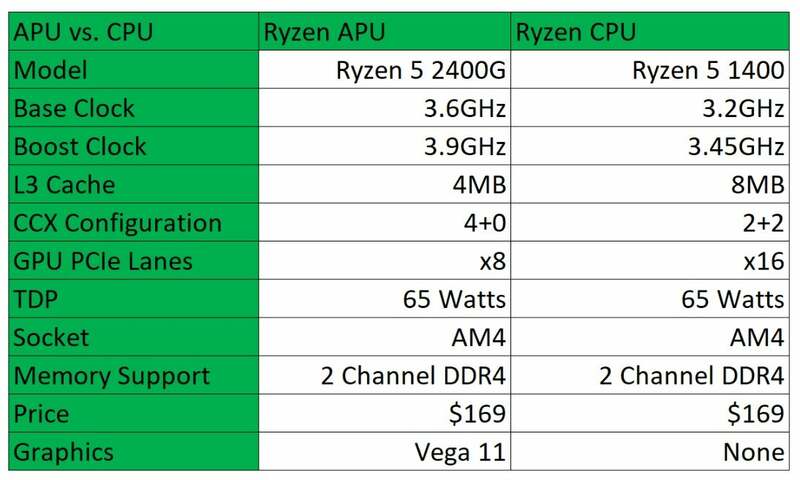 There are some key differences between AMD’s Ryzen APUs and its Ryzen CPUs. AMD didn’t get into why it cut the PCIe lanes, but we’d guess it’s due to the mobile roots of the APU. These APUs were designed to scale up from laptops to desktops and you just don’t need all of those lanes in laptops. Many tests over the years have shown PCIe lanes typically don’t impact GPU performance. We used an MSI B350 Pro AC motherboard and 16GB of G.Skill DDR4/3200 RAM. 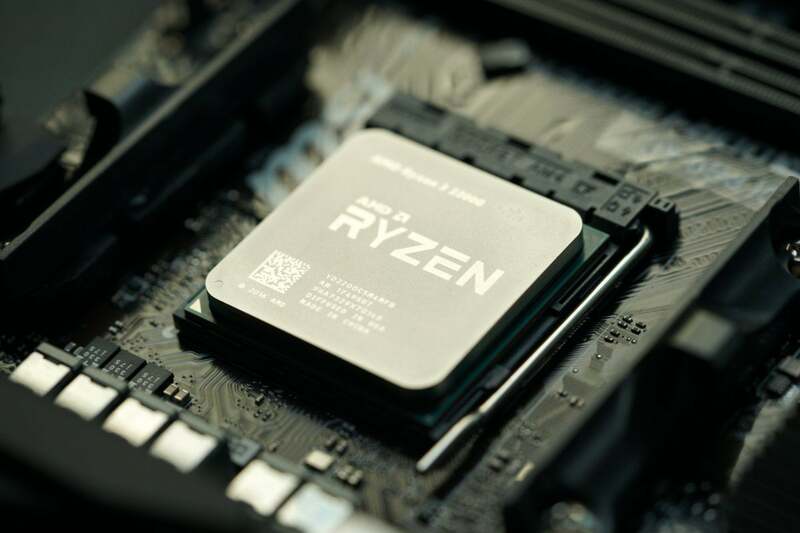 One last divergence between the CPUs and the APUs is a shift from a metallic solder thermal interface material (TIM) used in Ryzen CPUs to a paste-type material in the Ryzen APUs. AMD admits it did it to save bucks. When the internet learned Intel used a paste TIM in its Skylake-X chips, nerds went apoplectic at the thought of lowly paste in a performance CPU. With the Ryzen APUs, I anticipate less rage. Even though the move to paste will lower the APU’s overclocking potential, these are budget parts, not $2,000 CPUs. For our performance test, we built on an AMD-supplied MSI B350 Pro AC motherboard and 16GB of G.Skill Flare DDR4/3200 RAM, approved and supplied by AMD. For storage we opted to use a 240GB Kingston HyperX Savage SATA SSD rather than an M.2 NVMe device, which would add to the cost and likely isn’t the first choice of someone buying a $99 APU. All testing used the bundled AMD cooler. For performance context, we decided to use an Intel Core i3-7100 chip. It’s a dual-core 7th-generation Kaby Lake CPU with Hyper-Threading, and costs $115 on Amazon. It doesn’t have TurboBoost, but its base clock is a hefty and constant 3.9GHz. For graphics, it features Intel HD 630, which is used on everything from Core i7 to Core i3. We sourced this CPU from Amazon and used the stock cooler for our tests, along with a Gigabyte GA-H270M-DS3H MicroATX board. If you’re thinking we intentionally tried to make Intel look bad by not using the similiarly priced 8th gen Core i3-8100, we can explain our real reason in two words: motherboard costs. With Kaby Lake, you can get an LGA1151 board for as cheap as $50 using H-series chipsets. So far, Intel has not released a budget chipset for its 8th-gen CPUs, which means the cheapest Z370-board we could find was $120. The graphics comparison should mostly be the same, as Intel’s UHD 630 is essentially the same as its HD 630. While the Core i3-8100 is a quad-core, its lack of Hyper-Threading and overall lower clock speed (there’s no Turbo Boost) would probably put the two a lot closer in performance than you’d expect. One last thing we want to note: We used 16GB of DDR4 on both platforms, both rated for DDR4/3200. However, the Core i3 would not run higher than DDR/2400 on our H-series board. That led us to ponder whether it was fair to test the AMD using higher-clocked RAM than the Intel board. 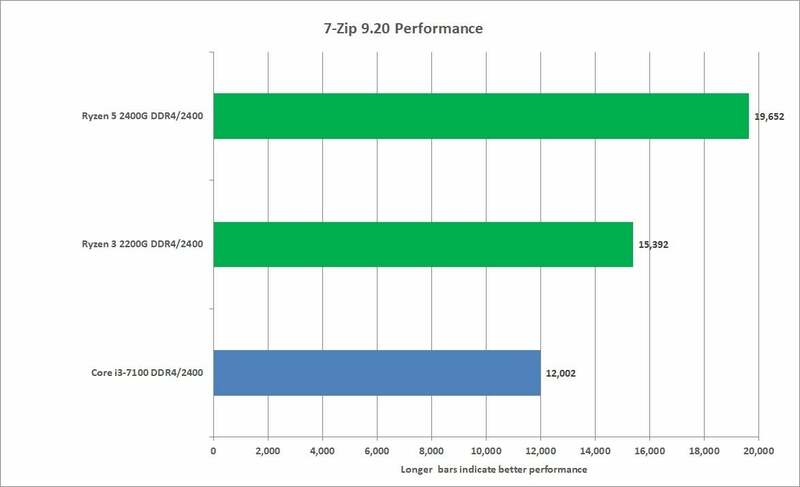 Ultimately we did test the AMD APUs at the higher speed as well as DDR/2400, but for our CPU section, we decided to present results at DDR4/2400 clock speeds. In our gaming section, because memory clock speeds are critical, we show multiple speeds. Because Ryzen does benefit from higher clock speeds, you can basically add about 5 to 6 percent to the performance of both APUs at higher clock speeds. Lastly, while we had no issues running the Ryzen 3 2200G at DDR4/3200, the Ryzen 5 2400G was finicky with reboots occurring when using the preset XMP 3200 profiles. We suspect this is mostly a tuning issue that will eventually be worked out. We tested both Intel and AMD with all of the available Spectre and Meltdown patches in place. All our tests were completed with fresh installs of Windows 10 Fall Creators Update with the latest patches installed. And yes, that means we ran our tests with patches for the Meltdown and Spectre exploits in place. On the AMD platform, that means just OS updates. On the Intel platform, that meant a microcode update as well. 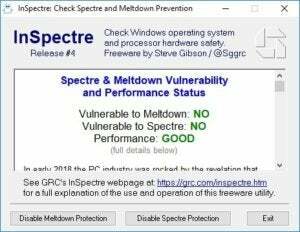 Although some vendors have yanked their Spectre microcode fixes, Gigabyte still offered it for the motherboard we used, so we installed it and verified it with GRC’s InSpectre. Our first test is the venerable Cinebench R15.038 test. Based on Maxon’s professional rendering engine, it’s pretty much a pure CPU test and scales well with thread and core count. 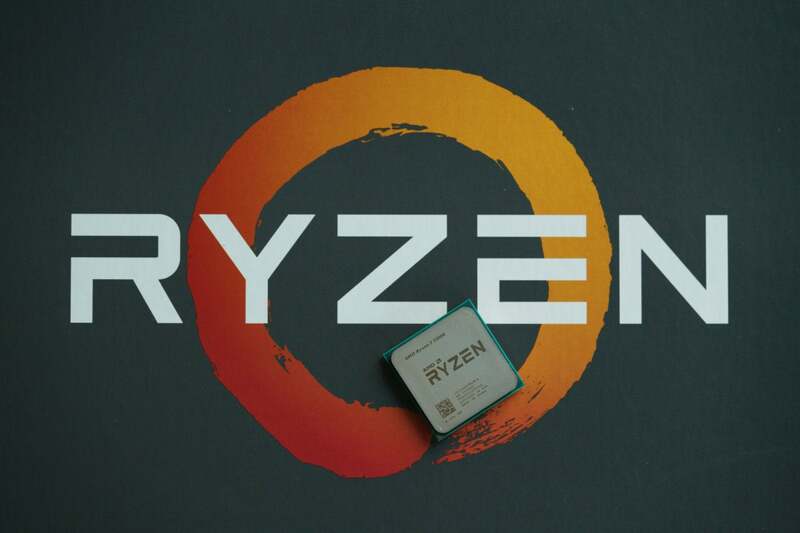 The result is no surprise: The quad-core $99 Ryzen 3 2200G easily outstrips the $116 Core i3 by 42 percent. 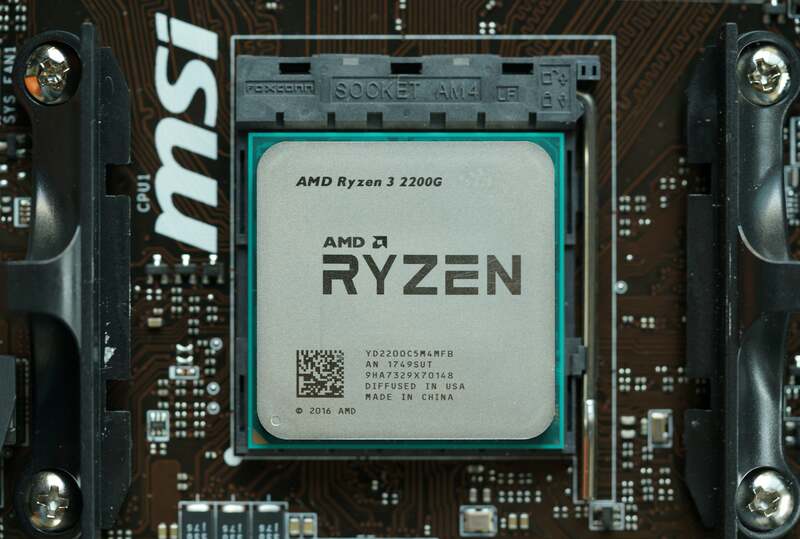 Going from the Ryzen 3 2200G to the Ryzen 5 2400G, we see about a 35-percent bump by adding SMT support. 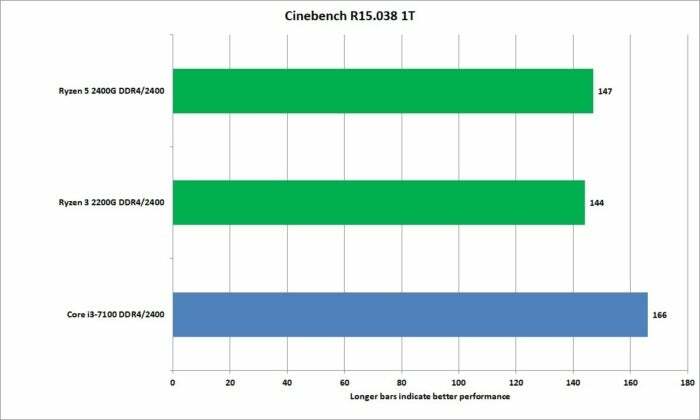 The quad-cores chips easily rule over the dual-core Intel in the multi-threaded Cinebench R15 test. Not everything is multi-threaded, though, so we also run Cinebench R15 using a single compute thread. Here’s one test where the Core i3 ekes out a win. 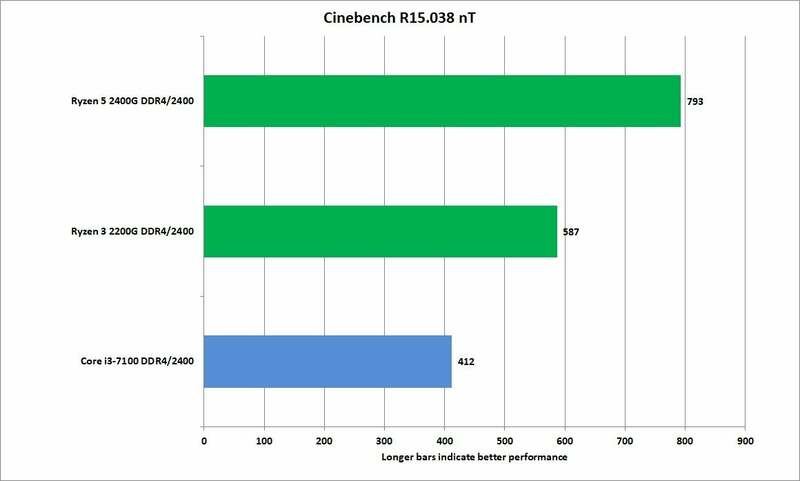 In Cinebench R15’s single-threaded test, you can see the slight clock-speed and IPC advantage that Intel’s Core i3 has. Higher-clocked RAM helps the Ryzens, but if the RAM is the same, Intel is ahead. Should you be surprised? Not really. Intel’s advantage in IPC (instructions per clock) efficiency is real. When combined with its full-time 3.9GHz clock speed, it’s a fantastic chip for single-threaded tasks. In fact, for uses outside of gaming, it’s a fine CPU. Our next test uses the free and popular HandBrake encoder to convert a 1080p high-bit-rate file using the Android Tablet preset. 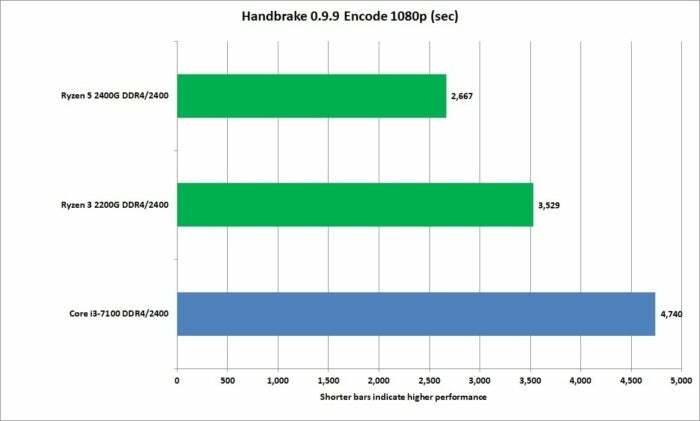 HandBrake, like most video editing and encoding applications, loves CPU threads, and the Ryzen APUs walk away from the dual-core Core i3. We suspect the Core i3-8100 would be very competitive here with the Ryzen 3 2200G, but again—it’s another $70 out of your pocket to run that Coffee Lake CPU. Our next test uses the free 7-Zip utility and its built-in performance benchmark. The test is a CPU test and doesn’t look at the disk I/O as a factor. AMD again leads the way, with the dual-core Core i3 landing where we expect. The 7-Zip compression/decompression test puts the Core i3 within striking distance of the Ryzen 3 2200G, but once you add SMT to the Ryzen 5 2400G, AMD is clearly ahead. Now we know AMD gives you more cores or more threads than Intel for the money, but Intel’s cores are also generally better. Let’s see how that plays out in games. 3DMark Sky Diver is fairly lightweight—basically like playing a typical eSports game—and therefore a useful tool for measuring, say, integrated graphics. Rather than use the overall score, which factors in CPU performance, we’re drilling down into the graphics subscore. The score you see for the HD 630 should be familiar, as it’s what most IGP-based Intel laptops have coughed up for the last year or two. With the Ryzen 3 2200G and its Vega 8, you’re looking at more than a 133 percent increase in performance compared to Intel’s Core i3. The Ryzen 5 2400G takes that to 178 percent. Let’s say that again, but slowly: 133 percent and 178 percent. 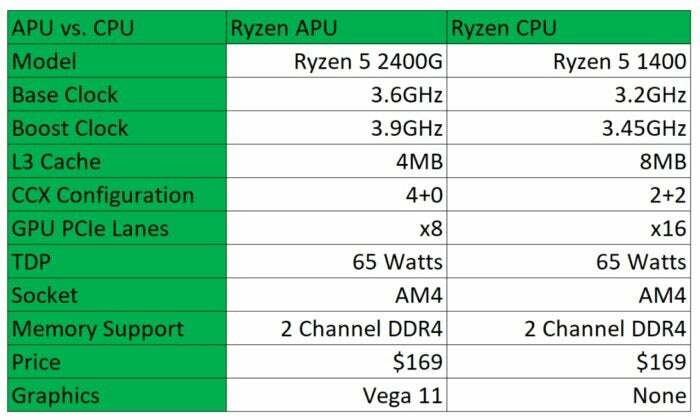 Detailed specs of the graphics cores in the new Ryzen APUs with Vega graphics. For comparison, a Radeon RX 580 offers 6.1TFLOPS of performance. The thing is, on desktop chips, it really doesn’t get any better for Intel. Its Iris Plus lineup of graphics with EDRAM isn’t available in a socket. And mind you, this isn’t even accounting for the speed advantage of using higher-clocked RAM in Ryzen. 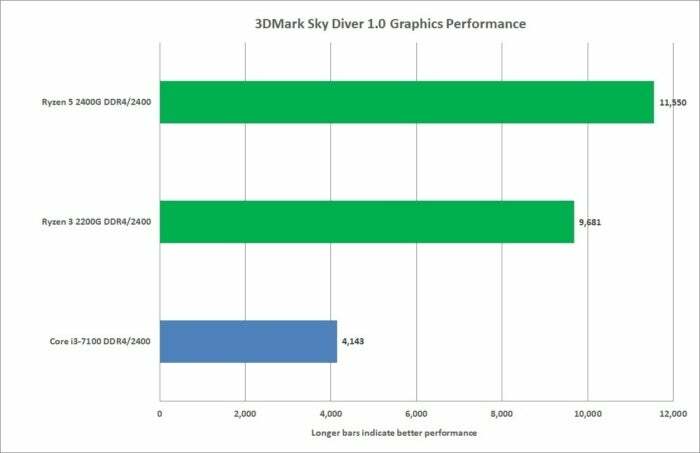 The lightweight Sky Diver test shows the limitations of Intel’s HD graphics over the Vega cores in the Ryzen APUs. Let’s step up to something a little harder: 3DMark Fire Strike. It’s obvious Intel’s HD 630 isn’t up to the task, so we pulled numbers from a Ryzen 5 1600 system with a Radeon RX 550 2GB card in it. This Polaris-based GPU can be found everywhere from $110 to $150. The tests we selected are mostly GPU bound, so the obvious increase in core count on the Ryzen 5 1600 should have minimal impact. I’m also going to rope in performance results for the Ryzen APUs with faster RAM. 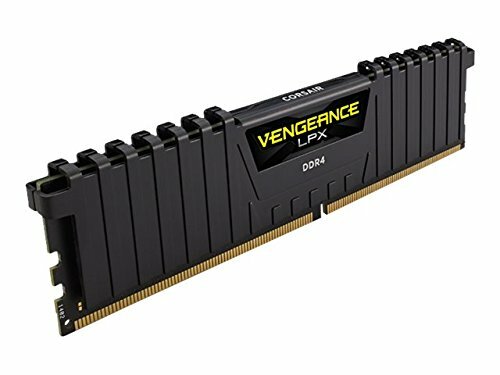 As a reminder, I used DDR4/2933 scores for our Ryzen 5 2400G, because it wasn’t quite stable at DDR4/3200 with the G.Skill modules AMD provided. While the Radeon RX 550 leads the way, it’s hard to say that difference is worth $110 to $150. The results speak for themselves. The Radeon RX 550 clearly has a lead, but those APUs come close. It’s really hard to justify a $110 to $150 premium for that difference. Putting that money into a larger SSD or more RAM—or socking it away until you have enough for an RX 570—makes a lot more sense. 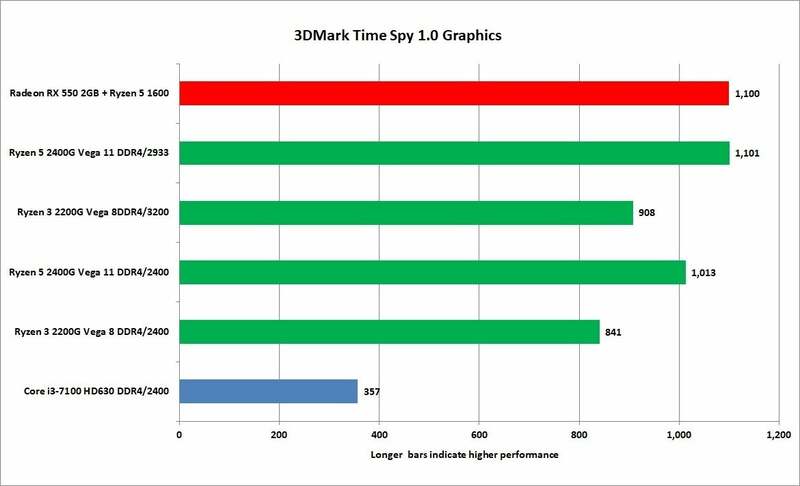 Our last 3DMark test for now is Time Spy. It’s a test built completely to test DirectX 12 gaming performance. Interestingly, the lead the Radeon RX 550 had in the DX11 Fire Strike test evaporates, and surprise, the Ryzen 5 2400G is equal to it when running higher-clocked memory. The Ryzen 3 2200G also represents well and for the money, it’s cooking along nicely—especially when compared to Intel HD 630 graphics. In the DirectX 12-focused Time Spy test, the Ryzen 5 2400G pulls dead even with a $110-$150 GPU!